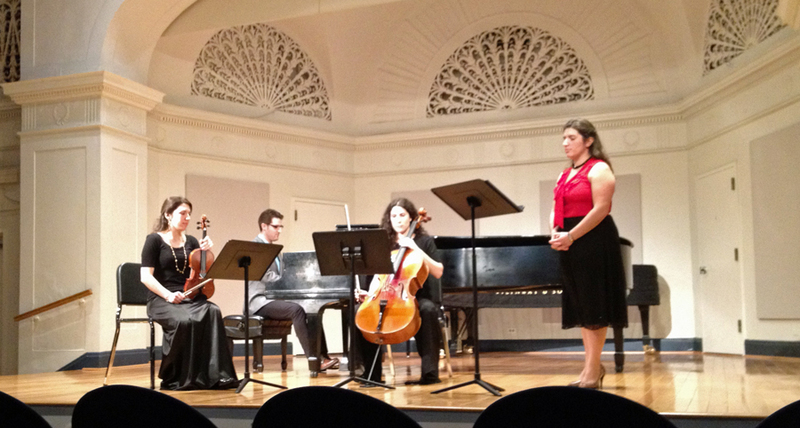 I was very pleased to wel­come some new inter­preters of my music this past week­end, Feb­ru­ary 19. Sofia Dim­itrova, soprano, and her sis­ter, Stanichka Dim­itrova, vio­lin, have per­formed my music many times. This past week­end I was delighted to wel­come some new musi­cians: Christo­pher Schneller, piano, and Claire Stan­car­one, cello. They per­formed my Three Part­ings, a song cycle of three poems by Lord Byron. It was pre­miered a year ago in New Jer­sey with dif­fer­ent singers in the dif­fer­ent songs, but this year it was per­formed as a whole song cycle. 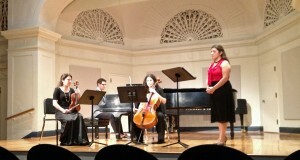 It was a marathon con­cert at Mannes Col­lege of Music, with many of the school’s com­posers (alumni and fac­ulty) con­tribut­ing pieces to the afternoon.